I have about a million little holiday projects in progress right now, but this one is the first to the finish line! 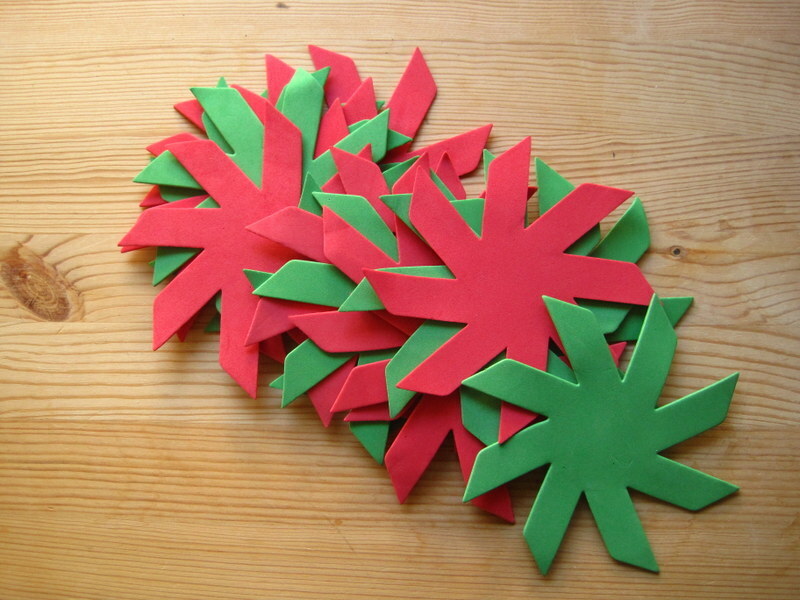 I have been meaning to stitch these foam snowflakes together ever since I got them at Art from Scrap in Santa Barbara. It turns out that that’s kind of hard if your sewing machine is buried behind some big piles of paper (scrapbookers anonymous…), but yesterday I excavated it and stitched this garland up. I bought 16 of these guys for 10 cents each. That’s my kind of price. They’re very thin, so I knew I’d have no trouble feeding them through the machine. I have seen so many pretty garlands like this one, some of them even made with paper, but I had never tried this kind of stitching, with huge spaces in between the shapes. It felt a little weird, but it totally worked. The machine left some indentations on one side of the foam, but that doesn’t bother me. Every snowflake is an individual, right? I used a silvery thread to keep with the holiday theme. I stitched three different garlands because I initially wanted to hang them side by side from the ceiling in front of our door. However…we have popcorn ceilings in the hallway, so that was not going to happen. I ended up stringing one across the top of the door and two hanging down by the sides, and I like it so much better this way. Also, I am sure Eric appreciates not being hit in the face by swinging foam snowflakes every time he comes home from work. I just have these hung with packing tape, but I might put little bows at the corner to cover the shininess. 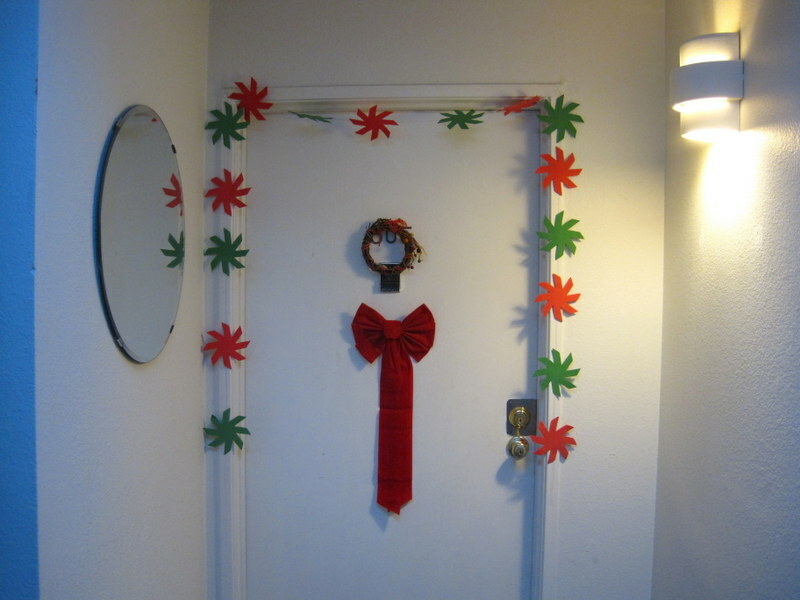 Also, say hello to our other doorway decor: a little wreath I bought at the Depot years ago and pretty much just leave up all year round, and a big red bow I bought at the Dollar Store. 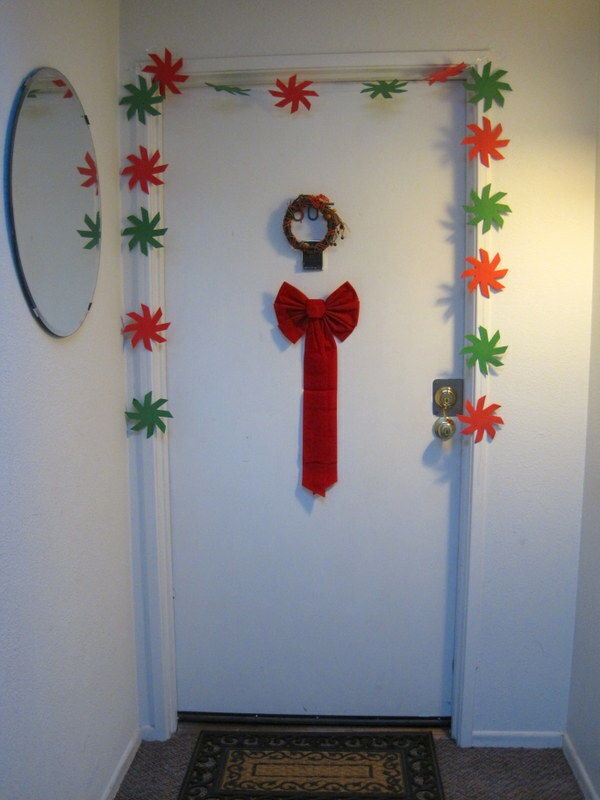 If you are looking to do Christmas decor on the cheap: get thee to the Dollar Store! They have some quality items. Cousin Eddie told me so. Your door looks lovely! I have a wreath to hang on ours, but I didn’t make it. 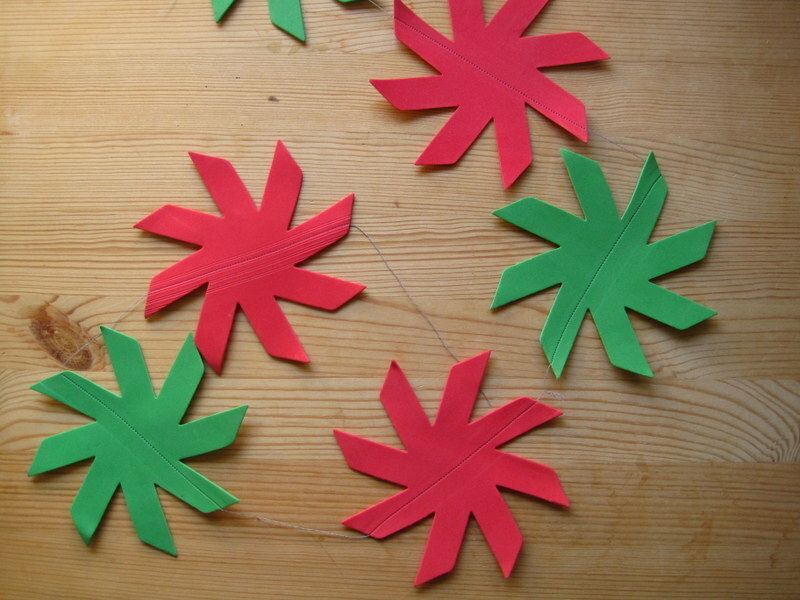 I’ve always fancied making a fabric wreath, one of these days I’ll get around to it. I’m too busy this year knitting gifts! Me too! I have been wanting to get one for a long time:) I initially wanted one that was covered in red glitter, but Eric thought it would get everywhere. And I said, “And the problem with that is…?” 🙂 But they didn’t have glittery ones at the store, so velvet it is!